O’Donnellan & Joyce auctioneers is back with the latest instalment in its Wild Atlantic Way auction series. With the property market on the increase now is the perfect time to be a seller or a buyer. There are properties becoming available and buyers ready to buy. The auction is set for Friday November 10 in the Harbour Hotel, New Dock Road, with an exceptionally wide variety of properties, from family homes to prime investments, spread across the Wild Atlantic Way, making this winter auction the company's strongest and biggest yet. Colm O’Donnellan of O’Donnellan & Joyce commented: "We have an exceptional variety of different types of properties, both residential and commercial, in prime locations including Taylor's Hill and Devon Park. There are also a wide variety of commercial investor properties available which a producing yields of up to 18 per cent. There is no doubt something for all types from family homes to investors looking for properties with a high return." The properties available in the November 10 auction include the following. 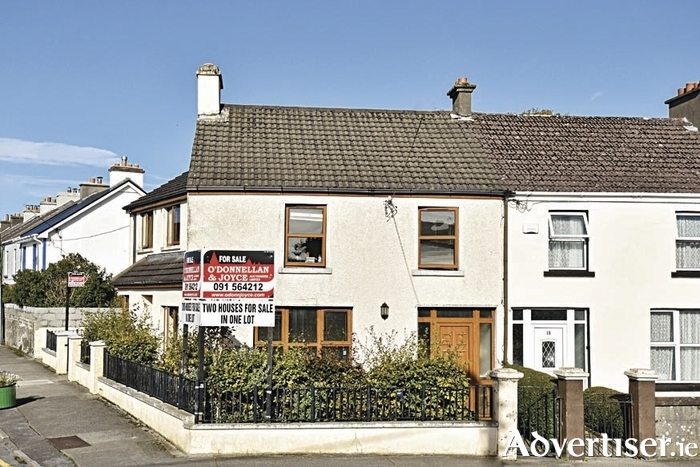 This semidetached three bed house, over three storeys, is an excellent home in one of Galway's most desirable locations. The property is presented in good condition, and would benefit from some modernisation. Devon Park has long been considered one of the most popular residential areas of Salthill, and indeed of Galway, and its reputation continues to grow. With a host of quality schools, both secondary and primary, within close proximity, this would be regarded by many as a home for life. Probate sale. AMV: €385,000. Open viewings Wednesdays and Saturdays 3.30pm to 4.30pm. Charming four bed semidetached dormer bungalow. The interior of this home is finished to the highest standards, with quality fittings and fixtures throughout, and a large conservatory to the rear. The property is of the highest quality spec throughout and in turnkey condition, with off street parking and a well manicured rear garden. A wonderful family home in mint condition. AMV: €300,000. Open viewings Wednesdays and Saturdays 3.30pm to 4.30pm. Prime Galway city property. City centre three bed mid-terrace house, in need of total modernisation. The property is a blank canvas giving huge scope to put your own mark on it. This property is in an excellent location with huge potential for an investor. Positioned on the street that links Dock Road and Merchants Road. Stunning two bed semidetached house located in the Renville Village estate. The property is presented in excellent condition, including a solid fuel stove and back boiler. Built in the 2000s, this property is a perfect starter home or investment property. The property is located in Galway Bay Golf Resort, your handicap will be guaranteed to improve if you aquire this property. Is is just a short drive from Oranmore village. AMV: €175,000. Open viewings Wednesdays and Saturdays 11am to 12 noon. A listed building situated in Ros Geal, a residential estate of semidetached homes within easy access of NUIG, UHG, and Galway city centre. This is a high profile listed building known as Rahoon House. Previous planning permission reference 07825 for four two-bedroom apartments. The site is located on the west side of Galway in the highly desirable location of Sea Road. The property is just a stone's throw from the city centre with its many shops, bars, and restaurants. Sea Road is one of Galway's most established residential areas, this is the last remaining site in the locality. This is a once in a life time opportunity. Brú na Mara, Fort Lorenzo, is a lovely, quiet, mature, development located between Taylor's Hill and Kingston and just off the roundabout on Bishop O'Donnell Road, a superb location that is only a few minutes’ walk from Salthill Promenade. The property is a very deceiving four bed family home that enjoys a good sized garden to the rear and ample living and sleeping space inside. This is an excellent family home that is located within easy reach of all amenities and schools in the area. AMV: €230,000. Open viewings Wednesdays and Saturdays 2pm to 3pm. Duplex two bed apartment over ground floor and first floor. Open plan kitchen and living area using an abundance of space. Residential parking available with own entrance. Fort Lorenzo is located just off Taylor's Hill and Kingston and No 7 stands on an elevated site to the rear of the development. It is walking distance to the Salthill Promenade and all other amenities in the area. The ideal property for an investor. AMV: €165,000. Open viewings Wednesdays and Saturdays 2pm to 3pm. This beautiful four bedroom detached property is located in the much sought after address of The Nurseries on Taylor's Hill, Galway. This house is in pristine condition and a wonderful family home. It is the ultimate location in Galway city containing spacious accommodation throughout. It is a great opportunity to acquire a special family home in Galway's premier residential address. Open viewings Wednesdays and Saturdays 12.30pm to 1.30pm. Charming four bed semidetached house. A stunning property in turnkey condition throughout with a large front garden providing off street parking and side access to the rear south facing garden. Shantalla continues to grow as a popular area for Galway residents. Ideally located within moments of Westside Shopping Centre, Aldi, and a host of schools and sporting facilities. AMV: €335,000. Open viewings Wednesdays and Saturdays 2pm to 3pm. No 16 Shantalla Road is a modern home with quality interior throughout. The accommodation includes an entrance hall, kitchen/lounge and a shower room on the ground floor. Upstairs the property offers a main bathroom and three bedrooms. No 16A faces onto St Enda's Road, Shantalla, and is a relatively new build that oozes style and is finished to the highest standards throughout. The accommodation includes an entrance hall, downstairs toilet, and a lounge/kitchen. Upstairs the accommodation comprises a main bathroom and two bedrooms. AMV: €180,000. Open viewings Wednesdays and Saturdays 12.30pm to 1.30pm. Five bedroom semidetached residence located on the main Dublin Road approximately 3km from Galway city centre. Requires upgrading and modernising throughout. Ideal investment property. AMV €180,000. Viewing by appointment. Circa 1.1 acres of agricultural land. Contains no planning. Folio GY89973F. AMV €10,000. Full details on request. Store/warehouse on a circa 0.37 acre site located in the centre of Portumna town adjacent to both primary and secondary schools. Zoned community facility. Folio GY19306. AMV €15,000. Full details on request. Circa 0.535 acre site located within easy access of Caherlistrane village. Previously contained planning permission for a bungalow. Planning ref 06/2967. Circa 0.5 acre site located within easy access of the towns of Headford and Shrule. Previously contained planning for a dormer residence. Planning ref 07/757. Two bedroom ground floor apartment with own front and rear entrances. Located in Tuam town centre. Ideal starter home or investment property. Sold with tenants in place. AMV €95,000. Viewing by appointment. Ground floor retail unit of c900sq ft with overhead storage space. Currently let and generating a rental income of approximately €5,700 per annum. Ideal investment property. AMV €85,000. Viewing by appointment. Superb investment property comprising a grocery store/filling station. Being sold with tenant in place on a 20 year lease from 2013. Currently generating a rent of €2,000 per month. AMV: €170,000. Viewing by appointment. Border, Midland, and Western Regional Assembly: ground and first floor office and conference centre let on a 25 year lease from 2001 at €85,310 per annum. Currently renting at €79,228 per annum. JP Bookmakers: Ground floor retail unit let on a 21 year lease from January 1 2006 at €20,000 per annum. Post office building: retail unit extending to 1,060sq ft approx. Let at €12,000 per annum on a five year lease. Former convenience store: vacant retail unit extending to 1,060sq ft approx, together with two apartments overhead on the first floor. AMV: €680,000. Viewings by appointment only. For further information on these or any of the properties for sale, contact the sales team at O’Donnellan & Joyce auctioneers, 5 Mary Street, Galway, on 091 564 212, [email protected] .